Last Wednesday I became an honorary member of the WI for the day when I joined their coach to London. 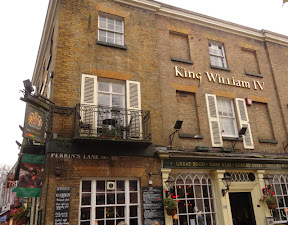 We started the day with a lovely Christmas turkey lunch with steaming hot mulled wine at the King William pub in Hampstead. 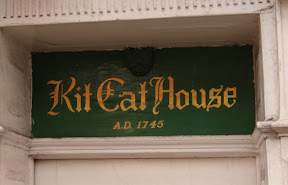 Not only is Hampstead the highest place in London, it was - and is - a favourite haunt of many famous people. We were given a guided tour by a very knowledgeable lady who seemed to know every nook and cranny and related a host of interesting stories. For instance I didn't know that the painter John Constable is buried there and that he was derided by the so called experts for painting landscapes in their real colours. It seems that up until his time most greens were painted in 'violin brown'! We were told that he took one of these critics into a field and held a violin up in front of a green landscape to show him there was no colour match, then smashed it on the ground. 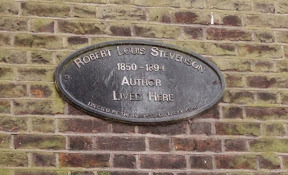 Robert Louis Stevenson lived in Hampstead. 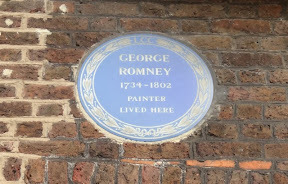 As did Peter Cook and the painter George Romney. 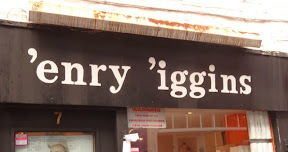 We walked around for about an hour, up hills and down hills, passing many quirky establishments. 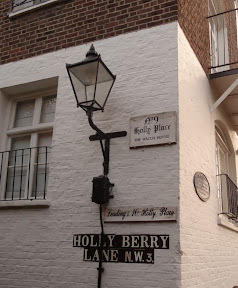 And here was established the Hampstead Police Force in Holly Berry Lane. 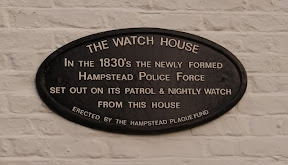 Called The Watch House. As dusk was falling we were taken on a trip round the centre of London to see the Christmas decorations. I wish we could have stopped at Harrods because their windows were decked out as carriages in The Orient Express. The front window was taken up by a complete steam engine. 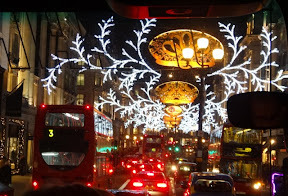 Regent Street looked good with a reindeer antlers theme. 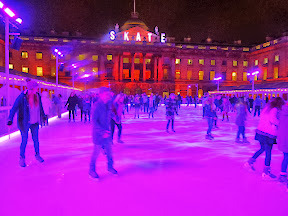 Then we went on to watch the skaters on a rink at Somerset House bathed in ultra violet light. A really interesting day. But the trip back to Henley wasn't so good as a broken-down single car on the elevated section of the Hammersmith flyover caused miles of incredibly slow moving traffic so instead of the less than an hour's journey it took over 3 hours to get home! Now I'm back to painting full time with three miniature commissions to be painted before Christmas - if I can manage it. Starting yesterday with a cute little baby boy. 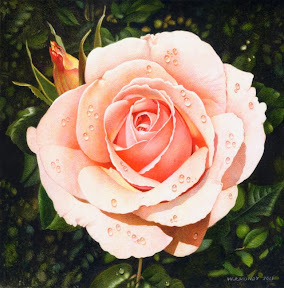 I did finish the rose and raindrops watercolour on Wednesday. At last - as it took much longer than I thought it would. Here's the result. In my 'spare time' I'm making a scale model of my young friend's new garden. The other evening I made a 3 inch high pergola out of balsa wood and painted it ash green. I'm not so sure I will be capable of making the real thing when spring comes next year. On Wednesday, together with Jilly, Jane and Brian, I went to a charity evening at the Chocolate Cafe in Henley. It was in aid of the recent Earthquake in the Philippines with Mike Read acting as compere. The evening took the form of a 'pop music' sixties quiz. That meant that I knew absolutely nothing and couldn't even answer a single question. (The reason being that when I went to live in Singapore in January 1960 Lee Kuan Yew had just become prime minister. One of his first acts was to ban pop music - only allowing classical and Chinese music. (I was told at the time that he ordered all the jute boxes to be thrown into the sea!) Then in 1964 I went to Bangkok to live for another 7 years. There they only played Thai music). So at least my ignorance has a logical reason. Jane was the most knowledgeable on our table. 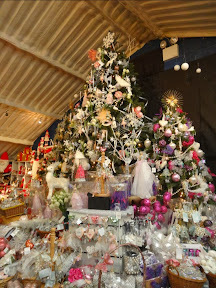 Finally we had a look round the Tree Barn in Christmas Common. 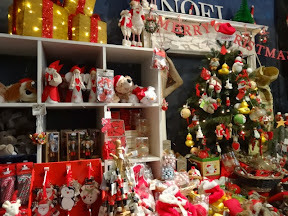 Bought a few decorations there. So tonight and tomorrow we'll start putting up our own trees. I've popped down to the River and Rowing Museum a couple of times after the opening. One time Mike Read walked round interviewing me for his BBC Radio Berkshire programme. It was broadcast on Monday afternoon and lasted about 15 minutes. 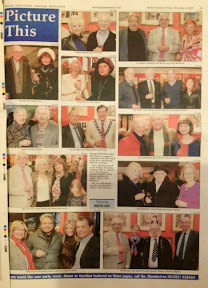 Today the Henley Standard printed a full page of pictures about the opening. I'll see whether this iPad can take a photograph of it.